Sorry for my English in this page. I know that it is very bad, and I'm sure that a lot of grammar and spelling corrections should be added. Welcome to the Juan L. Varona WWW page. It offers information about myself, as well as on aspects related to my research and subjects of personal interest. Also, pushing here you can get many of my research papers and other publications. If, instead, you are interested in my teaching at the university, push here. And here you have my complete address. Recently, I have written a book devoted to the Theory of Numbers. You can get more information in this page (in Spanish). and I has been President of CervanTeX (the Spanish speakers TeX Users Group) for ten years. I was born in Tudela (Navarra, Spain) in 1962, although by chance; it can be said that I am of Alfaro (La Rioja, Spain), where I lived when a child. I received the master's degree in Mathematics by the University of Zaragoza in 1985, and read the doctoral thesis (tex, pdf) in the University of Cantabria in 1988, under the direction of professor José J. Guadalupe (Chicho). I am Full Professor in the Universidad of La Rioja. Usually, I teach Numerical Analysis, Mathematical Analysis and Theory of Numbers in the Degree of Mathematics, as well as some courses of TeX. Fourier series of orthogonal polynomials, both classic polynomials and modifications of the measurement adding deltas of Dirac. Series of Neumann type, and its relation with Hankel transform and the dual integral equations. Fourier series related to the Dunkl transform, as well as sampling theorems and uncertainty. If you have more details, or you are interested in this subjects, you can download my Ph. D. thesis (in Spanish) and the most part of my papers pushing here. I have written some papers about fractals related with iterative methods. Most of them are divulgative papers, and they have the necessary code (in Mathematica) to reproduce the pictures involved. If you are interested, you can download the papers and the corresponding code from here. On the other hand, years ago, I developed several applications for Macintosh that allow to draw fractals or drawings coming from dynamic systems. But for a long time I have not been updating them; as a consequence, they are not Power Macintosh native and they seem poor if compared with more modern others. Someday I will retake this. I have been working in several subjects related to elementary number theory. I no longer continue with them but, for years, most part of my research on number theory was devoted to aliquot sequences. If a positive integer number n is taken, we denote sigma(n) the sum of its divisors (including 1 and n), and s(n) = sigma(n)-n the sum of its divisors without n. By iterating the function, it appears the so called aliquot sequence. For instance, n = 20, s(20) = 1+2+4+5+10 = 22, s(22) = 1+2+11 = 14, s(14) = 1+2+7 = 10, s(10) =... Then, the conjecture of Catalan-Dickson assures that all these sequences finish in 1 (being the previous term a prime number), a perfect number, a pair of amicable numbers, or a cycle. No counterexample is known nor the conjecture is proved. In this subject I have worked in collaboration with Manuel Benito (who, by the way, also has written a book on Brocot sequences). We have obtained a computation record: The aliquot sequence that begins in 3630 converges to 1 in 2624 iterations after to have reached a maximum of 100 digits (in base 10) in iteration 1263. If you are interested in this, click here to find more information on our work (in English). In Spanish, you can read this article, that is an enlargement of the one that appeared published in La Gaceta de la RSME. Also you can accede directly from here to the table with the present state of the sequences that begin in a number smaller than 10000 and whose end is (still) not known, and to the tables of 80 digits, 90 digits and 100 digits. Now, my research work related to number theory is not so divulgative, and can be found in the page with my publications. I have written a book entitled Classic methods of resolution of ordinary differentials equations (in Spanish), published by the Service of Publications of the University of La Rioja (ISBN: 84-88713-32-0); it is sold by 3 euros. You can get it (dvi, pdf) with format dvi of TeX or pdf of Adobe. It can also be downloaded from the server ftp://mat.unirioja.es/pub/libro-ed. Although, considering its price, perhaps is seem better to buy it instead of printing it. The book studies, as much theoretically as by means of examples, the different methods to solve ordinary differentials equations. It allows, at sight of the aspect of an equation, to easily identify his type with the target to find its solutions. In separate files, there are a summary of the methods treated in the book, what I have named recetas (in English, prescriptions): dvi, pdf, servidor ftp server. Unexpectedly, on april 1, 2000, our college José Javier Guadalupe Hernández (also known as Chicho) died in a car accident. Chicho Guadalupe was initially my teacher, later on we became collaborators. His untimely death has meant the end of our joint work. But much more than his scientific presence, we shall miss his friendship and his warm personality. The Department of Mathematics and Computation of the University of La Rioja has published a book in honour of him (for historial interest, this is of the page with the call). The publishers of the book have been Luis Español and myself. Actually, this is not a published book, but a memoir on ordinary differential equations (in Spanish); it is devoted to be a guide on this subject to be used in the classes in the degree in mathematics. I wrote this memoir in 1992. Perhaps it will be useful for somebody. For more info, and for download it, push here (in Spanish). Encouraged by years of experience teaching courses on number theory, I have written a book on the subject. The title is Routes across the Theory of Numbers (in Spanish), it has more than 700 pages and it has been copublished by Electolibris and the Real Sociedad Matemática Española in its collection Universitary Texts. For more info, push here (in Spanish). Together with José Manuel Gutiérrez, I coordinated the seminary of my department during many years. Its activities consist in divulgative talks of mathematics with diverse subjects. For more info, and to see the complete list of talks since it began in 1978, push here (in Spanish). The digital journal Matematicalia has published an article (in Spanish) about our Seminario Permanente, the oldest divulgative mathematical seminary in Spain. You can also download it in pdf, tex or self-contained web page. I collaborated in the organization of the International Congress of Mathematicians ICM2006 (Madrid, from 22 to 30 of August of 2006), as a member of the Committee of Publications. Together with M. Sanz-Solé, J. Soria and J. Verdera, I were editor of Proceedings of the International Congress of Mathematicians, European Mathematical Society Publishing House, 2006 (Vol. II and III) and 2007 (Vol. I). TeX is a mixture between text processor and programming language; it is devoted, fundamentally, to write high-quality printed documents of scientific content. It was developed by Donald E. Knuth and at the moment are implementations for all type of computers. Many of them are free. LaTeX es a more powerful and easy of use language; it is based on TeX. I have collaborated in the activities of the Spanishspeaking TeX User Group, a.k.a. CervanTeX, of whom I am a member. Time ago, I participated actively in the writing of its statutes. I have always been interested in the developments of TeX to write in Spanish. I have collaborated making dictionaries, keyboard layouts, packages, collecting utilities and information, etc. Also, I support the server ftp://tex.unirioja.es/pub/tex, where you can found many material to download. For more info, push here (in Spanish). If you are looking how to use TeX/LaTeX in a Macintosh computer (and how to install it), read the next item. Usually, I use Macintosh; mainly now, with Mac OS X, that has a powerful and useful Unix kernel. I'm sure that I would also had enjoyed with Linux, but I'm very confortable with mac, and I don't find a powerful reason that incite me to dedicate all the time necessary to dominate a new computer platform. The front-end, i.e., the user interface to write the .tex file in it, to use the typeset button, to print, ...: TeXShop, by Richard Koch and the help of many people. In particular, I make the localization in Spanish. Important: TeXShop is not useful without installing TeX Live (see in the in the next item). The kernel (TeX itself): TeX Live, that has been developed by collaboration between many TeX users groups in the world. (teTeX and the i-Installer, from Gerven Wierda, is now obsolete). A spell checker (i.e., a dictionary) based on aspell: CocoAspell, by Anton Leuski. It acts as a service of Mac OS X and can be used not only with TeXShop, but by any other Cocoa application. I also made the localization into Spanish. Another spell checker: Excalibur, by Rick Zaccone. I wrote the Spanish dictionary (it has 292 thousand words). The best way of achieve the installation in a Mac is to go to the web page www.tug.org/mactex, where you can find MacTeX, an easy-to-install TeX distribution for MacOSX, that has been built by the MacTeX TeXnical Working Group of the TeX Users Group (TUG). It includes (among another utilities) all the programs cited in the previous items, with the exception of CocoAspell (if you want to get it, you must download it from its page). Finally, it will perhaps be usefull for you a keyboard layout developed by myself; it is particularly well adapted to write TeX/LaTeX in a Mac with a Spanish keyboard. Push here to read more information, or download it; it includes a file "Readme" with instruccions of how to use and how to install it. Check it! I am a amateur developer. Working with Macintosh computers, I have developed several programs, and collaborated in the development of others. Of course, no of them is commercial. I have already made reference to some of these programs in previous sections. It is economically profitable, and you contribute to avoid that some people to enrich with your money. If you collaborate with the developers, you can help to improve the product. You will avoid the problems of proprietary and close formats. You will contribute to a more free world. You will enjoy with all of this. Here there is a link to GNU, the main organization of free software. For mathematics, I suggest you try Sage, whose target is "Creating a viable free open source alternative to Magma, Maple, Mathematica and Matlab". As I have already mentioned, I am from Alfaro, a village on La Rioja (Spain). A person from Alfaro is said to be an "Alfareño"; however, in the edition 21 (year 1992) and previous of the Diccionario of the Real Academia Española (RAE), such word does not exist. In its place, there appears "Alfarense", a word that has never been used (at least, with this meaning). When I noticed the error, I take the initiative in get the change from "Alfarense" to "Alfareño". After contact with the RAE (actually, with its Instituto de Lexicografía) and realize a lot of efforts, some of them with the help of the Ayuntamiento de Alfaro, I had success. In the edition 22 (year 2001) of the Diccionario of the RAE already appears "Alfareño" (and "Alfarense" has been removed). I cannot finish without advocate you for visiting Alfaro. It is an eminently agricultural village with about 10 thousand people. 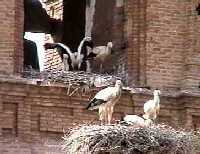 But it is internationally known because it has the biggest urban colony of storks in the world, a big part of it in the roofs of San Miguel's Church. It is marvelous to observe them from the balcony. The Real Sociedad Matemática Española (RSME), and Editor-in-Chief of La Gaceta de la RSME. The Sociedad Española de Matemática Aplicada (SEMA). The Sociedad Riojana de Profesores de Matemáticas (A prima). The American Mathematical Society (AMS). Former member of the Comisión de Información y Comunicación Electrónicas of the Comité Español de Matemáticas (CEMAT). The Grupo de Usuarios de TeX Hispanohablantes CervanTeX (president between May 2005 and February 2016). The TeX Users Group TUG. The Agrupación Astronómica de La Rioja (AAR). The Community of Neighbors of my house (web page under construction).